Durable and environmental, you can use them for home decoration or DIY art craft. Great for garment accessories, bag handles, macrame crafts, decorative wall hangings, rope bowls baskets, gardening, home decor projects and other common cord uses. - Durable and environmental, you can use them for home decoration or DIY art craft. 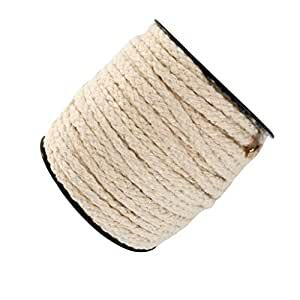 - Great for garment accessories, bag handles, macrame crafts, decorative wall hangings, rope bowls baskets, gardening, home decor projects and other common cord uses. Good for Rope placemat. Arrived earlier than expected.